333 years, the number of years ago that King Narai of Siam sent an embassy to France. 33,000 people, the number of estimated French nationals residing in Thailand. 3 months, since Monsieur Jacques Lapouge became officially the French ambassador to Thailand. It would seem that the number 3 was quite the theme of my March meeting with the French Ambassador to Thailand. From the wellbeing of the French community in Thailand, to education, to economic diplomacy, our conversation ran the gamut. 2019 is poised to be a very exciting anniversary year for relations between these two regional leaders. Mr Lapouge began his career in diplomacy in 1983. After completing a year of military service, some time in business school and then moving on to the National School of Administration in France, he “…chose to pursue foreign affairs and has never regretted it.” After his first posting in Ethiopia, the Ambassador served France in countries like Malaysia, South Africa and Sweden, and worked in the Ministry of Foreign Affairs as well as at the President and the Prime minister offices back home in Paris. This is his first appointment to Thailand. The Ambassador is excited about this assignment for several reasons. “I’m looking forward to this posting, of course, for the most obvious reasons. Thailand is a beautiful country in so many ways. The people are welcoming and friendly and the rich culture is wonderful.” But more importantly, as he said, “many people don’t realize the economic power of Thailand. People often thinks it’s all about tourism but Thailand is the 26th largest economy in the world.” 2019 will also prove to be an exciting year for all Ambassadors as Thailand will experience some major political events including an election and the coronation. Add to that the ASEAN chairmanship rotating to Thailand this year and it’s certain to be a year to remember for all in the diplomatic sphere. With so many French people making Thailand their permanent or temporary home and nearly 800,000 French tourists visiting the Kingdom each year, it’s the responsibility of the Embassy and the Ambassador to look out for the wellbeing of their citizens while they reside or travel in Thailand. There are currently 13,000 French nationals registered with the Embassy, only about a third of all legal residents. While it is completely up to each individual citizen to decide whether they would like to register or not (it’s by no means a question of legality), the Ambassador encourages people to do so in case of emergency. In the event of, for example, a natural disaster such as a flood or tsunami, the Embassy will be able to assist its citizens with much greater ease if they are registered. “Thailand is a safe country which is one reason why it’s so attractive for French people. Registering with the Embassy is free and easy and it allows us to help our expats and their families more if something goes wrong.” Promotion of tourism between these two nations is also on the agenda of the current Ambassador. Interestingly, Thailand and France are about the same size in both population and area. Plus, as Mr Lapouge pointed out, “Thailand also has one of the great cuisines of the world, like France.” Thailand is a very attractive location for tourists worldwide, nearly 40 million in 2018, and with 800,000 of them being French, it’s no surprise that the Embassy has tourism on their radar. Even the Ambassador has had a taste of tourism in Thailand. After arriving in Thailand 6 months ago, he did what he does in all countries that he’s posted to; he got a (hybrid) car and went on a 10 day road trip to get to know his adoptive home. In December of last year, Mr Lapouge took a self-driven trip and visited several provinces in the centre of Thailand. The Ambassador would also like to promote travel to France for Thai people. Right now, there are about 70,000 Thai people who travel to France every year and through various efforts, the French Embassy hopes to increase that number. Both France and Thailand are known for having very rich, albeit very different, cultures. The French embassy is doing a lot to encourage Thai people to learn and experience more with regards to French culture. Food festivals and art gallery exhibits are just some of the many opportunities for people in the Kingdom to learn more about France. 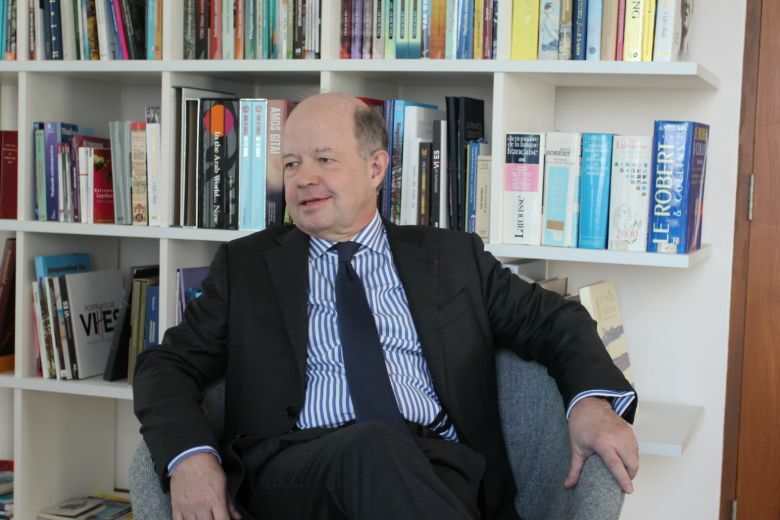 “We want to be one of the players in the field of culture”, said Mr Lapouge. There’s a beautiful book titled Made by Thai which was supported and organised by a French team to feature contemporary Thai artists. Released in February, it’s a fantastic example of cultural collaboration between these two nations. The team at the Embassy takes this cultural initiative seriously and goes so far as to open the architecturally stunning Ambassador’s private residency on the Chao Phraya river once a year for the public to see. 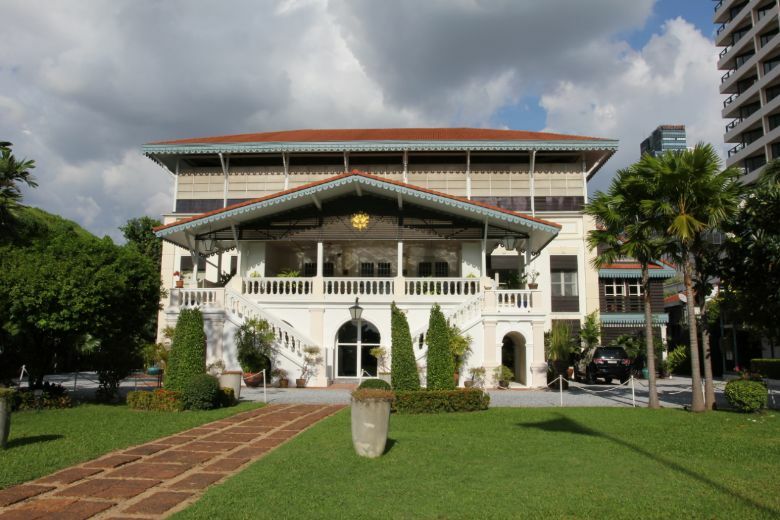 As one of the oldest diplomatic residences in Thailand, the shuttered house, which was constructed in the late 19th century, is an enduring reminder of the Franco-Thai relationship. One of the most well-known outlets for French culture is the Alliance Française, which the Ambassador explained just opened a brand-new building in Bangkok not far from Lumpini Park. AF has been operating in Thailand since 1912 and is currently under the patronage of H.R.H. Maha Chakri Sirindhorn. With branches around the country in Bangkok, Phuket, Chiang Mai and Chiang Rai, they are continuing to promote not only French culture but also language and history. In the new 4000 square metre building, there is a cinema, café, library and bookshop. Parking is free and for those who aren’t driving, the location is quite convenient near the Lumpini MRT station on Witthayu Road. AF has over 100 years of experience teaching French and welcomes nearly 5,000 students each year in Thailand. Continuing on the topic of education, Mr Lapouge discussed a bit about the educational ties between his home country and Thailand. Outside of learning French language, there are many opportunities for Thai students to study abroad in France. There are currently around 600 Thai students in France, 100 of whom are attending universities on some form of scholarship from either the French institutions themselves or various other sources. There are also quite a few French students attending classes at the top universities in Thailand. The opportunity for shared academics and cultural exchange is very important for the future of Franco-Thai relations. 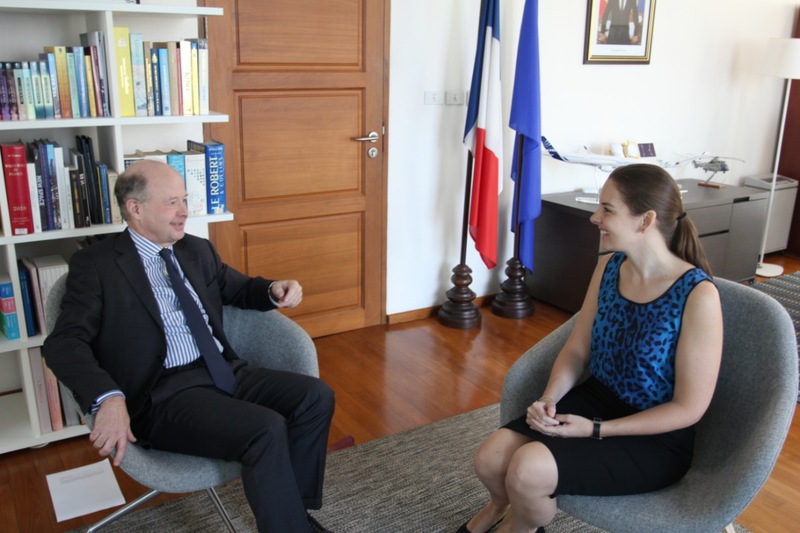 Besides all the human elements that touch the day to day lives of French citizens residing or travelling to Thailand, the Ambassador was eager to discuss France’s close economic relationship with Thailand and his goals for economic diplomacy during his Ambassadorship. Both countries are economic strong holds located in the centre of their respective regions and as such, have many possible areas for collaboration. Last June, before Mr Lapouge was appointed, General Prayut Chan-ocha travelled to France to meet the French President Emmanuel Macron and discuss economic relations. General Prayut returned to France again in November to observe Armistice Day. An invite has also been extended to President Macron to visit the Kingdom. One of the Ambassador’s aims is to continue the positive momentum that these meetings have generated for the economic benefit of both nations. 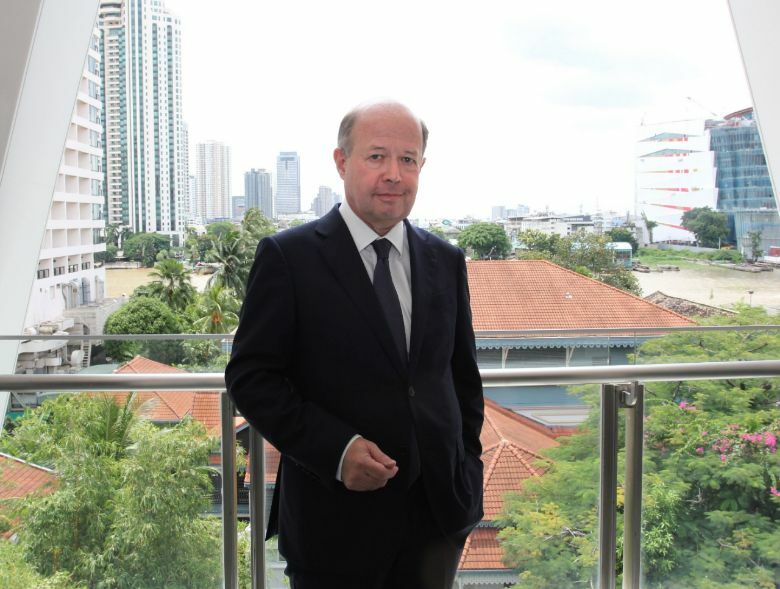 “Most great French companies have operations in Thailand”, commented Mr Lapouge. Whether its consumer goods, agriculture, manufacturing, transportation or technology, French companies have found a stable and prosperous adoptive home in Thailand. If you look in any high-end mall, you can see French luxury goods. Go to a nice restaurant and the menu will boast some great French wines. Even the cheese section of your local grocery store is evidence of the strong trade relations. Supporting the continued growth of imports and exports is a high priority for the Ambassador. Soon, there will likely be even greater collaboration between these nations as the French are bidding on several large-scale infrastructure projects that will change the face of the Kingdom. One such project on which a Memorandum of Understanding has been signed by Airbus and Thai Airways is a joint maintenance and repair centre at U-tapao airport outside of Pattaya for all types of wide body aircraft. Upon its completion, it will be the most advanced maintenance repair and overhaul centre in Asia Pacific and one of the most efficient in the world. Mr Lapouge and his team have a lot to look forward to in the upcoming years as the new Ambassador settles in to his post. With so many social, educational, diplomatic and economic projects on the horizon, may this 333rd anniversary year of Franco-Thai relations be auspicious for all involved! Jocelyn Pollak is an English teacher, teacher trainer and business owner. Originally from America, she has made Thailand her home for the last 6 years. As fitness, food, travel and education are her passions, her writing for Expat Life typically focuses on one of these areas.